When it comes to the heating and cooling in your home, it’s of the utmost priority to make sure you are working with professionals who really know what they are doing. We are those professionals, and we can help you with all of your heating and cooling needs in Upper Arlington, OH. Having NATE-certified pros on our staff means that our technicians are always updating their education and their certifications are current. This translates to better service, including installation, repair, maintenance and replacement of your heating and cooling systems. Give us a call to schedule heating and air conditioning services in Upper Arlington, OH and the surrounding area. We can help you stay comfortable all year-round with our comprehensive service offerings – all you have to do is give us a call! As one of the more northern states in the country, Ohio sees more than its fair share of cold, frigid weather. This makes it imperative that you have the right heating system in your home as well as a reliable one. Our pros can make sure you have the right heater in your home, or ensure that your existing one works optimally with expert repair and annual maintenance services. If you’ve noticed a drop in performance from your heating system, make sure to call Quality Air Heating and Air Conditioning right away. Our Upper Arlington heater repair and maintenance services will get you back up and running in no time. For furnace repair or maintenance, our technicians are highly trained on different system brands and types. Simply give us a call to schedule heating maintenance or emergency heater repairs. Do you use a furnace to heat your home, or are interested in using one? Then you have come to the right place! 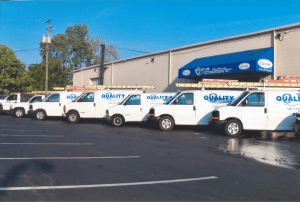 The experts from Quality Air Heating and Air Conditioning specialize in both gas and electric furnaces, and we can help you with installation, replacement, repair and annual maintenance. For furnace services in Upper Arlington, trust the pros at Quality Air Heating and Air Conditioning to get the job done right. Staying cool and dry during the summer months can be a challenge, but not when you have the HVAC experts from Quality Air Heating and Air Conditioning just a phone call away. Our NATE-certified pros can help you with the installation, repair, maintenance or replacement of a whole home AC system. We work with just about every type of air conditioning system around and all the major brands. Have an emergency? Just give us a call. We have 24-hour emergency service available should you ever need it. There’s no reason to be without the cool air you need with our pros on your side! From air conditioning tune-up services to installation and repair, we have everything you need. Air conditioning repair is a task that should always be left in the hands of a trained expert. The pros from Quality Air Heating and Air Conditioning have years of experience as well as NATE certification, so you can rest assured that when you call us for repair help with your AC, you are calling people you can rely on. Are you struggling with poor indoor air quality? Let our experts help. Our pros can diagnose your specific air quality issue, determine the right product for it and install it seamlessly to blend with your existing HVAC system. We can also make sure any existing IAQ components you have work optimally. Having balanced humidity is very important. Whether your home becomes too dry in the winter due to forced heat or you struggle with excess humidity during the summer months, our pros can help with the installation, repair, maintenance or replacement of a whole home humidifier or dehumidifier. Clean, healthy air doesn’t always just happen. Sometimes, you need some assistance to get the healthy air you need. Let our experts help with the installation, replacement, maintenance or repair of a whole home air purification system. Comfort in your business place is directly related to the daily operation of your business. After all, an uncomfortably hot or cold building is not conducive to conducting business, so it’s imperative to make sure your HVAC system is always working as needed. It is also just as important that your system operates as efficiently as possible. The trained and certified commercial HVAC experts from Quality Air Heating and Air Conditioning can help ensure the optimal operation of your commercial heating and cooling system with comprehensive service offerings that include installation, repair, maintenance and replacement. We know many businesses have someone on staff who is handy; that person may even be you. But handy isn’t enough to handle the repair of a major HVAC system like your commercial heating and cooling system. Instead, call the people you can count on day or night: Quality Air Heating and Air Conditioning.